Nottoway Lake is a scenic 188-acre impoundment located in Nottoway County, Virginia. With exceptional cover and a wooded shoreline, this lake offers a great opportunity for anglers to catch several warmwater species of fish in a rural setting. The lake was impounded in 1978 and opened to fishing just two years later. Most of the standing timber was left at that time as fish cover in the lake. The lake was stocked in 1978 with largemouth bass, bluegill, redear sunfish and Florida strain largemouth bass. 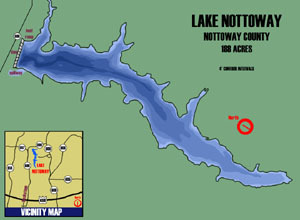 In 1979, Nottoway Lake was stocked again with largemouth bass. That year, channel catfish stockings of 25 per acre began and have continued in almost every other year since. The lake is owned and managed by the Va. Department of Game and Inland Fisheries. To reach this wonderful fishing experience, take Route 606 north off of Route 460 near the town of Blackstone, Virginia. Follow the signs for the public fishing lake to Nottoway Lake. The current fishery supports a healthy population of largemouth bass due in part to a 14 to 18 inch protected slot limit. The slot limit was imposed to allow harvest of ample numbers of largemouth less than 14 inches and still provide an opportunity to catch quality fish. Good numbers of largemouth bass in the one to three pound range are abundant with a few bass in the seven to ten pound range caught occasionally. Growth rates for largemouth are very good compared to the state average with most fish reaching catchable size at age 3. The spring spawn is the best time of year to catch a trophy-sized fish. Spinnerbaits, plastic worms and crankbaits are best suited for bass from April until early June. During the summer months and on into the fall, jigs work best when working deep water where fish congregate these times of the year. Bluegill and redear sunfish offer anglers in the spring a fantastic bank fishing opportunity. Spawning fish congregate in the spring on the shoreline along the dam where they are easily accessible. There are abundant numbers of both species weighing up to half a pound and the number of larger fish has been increasing over the last several years. This trend is expected to continue. Overhanging trees and submerged structure offer the best cover around which to find either of the sunfish species. Live bait, jigs and small crankbaits are the best lures for catching in the spring and summer months. Black crappie and channel catfish provide fishermen with a good change of pace when fishing. Numbers of crappie in the lake are low, however the average size of those fish is excellent. Small minnow plugs and live minnows are the best bet for catching these tasty fish. The catfish fishery is sustained by stocking fish every year. Natural reproduction is not successful enough to maintain good numbers of fish so the department releases about 15 fish per acre each year. A large parking lot provides ample parking for all anglers. Bank fishing is mainly limited to the dam and area surrounding the parking lot. The boat ramp is open all year round and night fishing is welcomed at the lake.